I started designing and making jewellery for knitters in May 2009. I love knitting and the designs sprang out of my desire to wear something wooly even when it was too warm for knitwear. In 2011 I made the knitted knitting octopus. He was featured across many craft blogs and there were lots of requests for the pattern. That was very popular and I have since been knitting and planning more patterns. I will be releasing lots more throughout 2013. 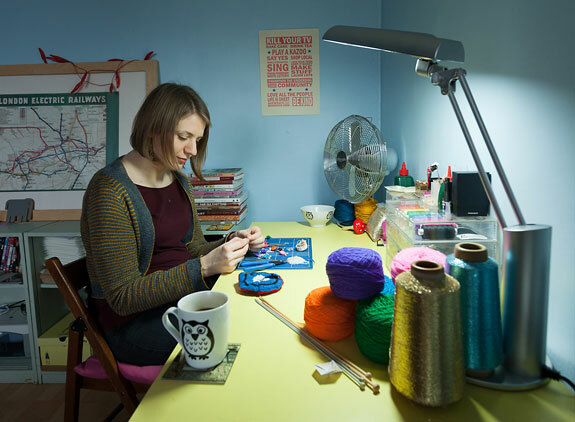 I also make large knitted sculptures and knitted stop motion animations (knitimations) although those have taken a back seat to the jewellery and pattern design recently. My knitimations won Best Animation at The National Student Film Festival in 2007 and 2008 as well as Best Music Video in 08. I’ve exhibited knitted sculptures at a number of venues in London including the Affordable Art Fair 2007 where I ran a workshop on knitting blood and eyeballs. – see more on my Press Page. For more details about my work history see my C.V.